1 of 5 In a medium bowl, stir together olive oil, lemon juice, Worcestershire sauce, mustard, garlic, salt and pepper. Whisk in 2 tablespoons of the Parmesan. 2 of 5 Place shrimp in a large resealable plastic bag and add 2 tablespoons of the olive oillemon mixture. Seal bag and shake to coat shrimp. Refrigerate for 15 minutes. 3 of 5 Heat grill pan on stovetop or heat gas grill to medium-high heat. Coat cooking surface with nonstick cooking spray. Grill shrimp for about 2 minutes per side. Remove from grill. 4 of 5 In a large bowl, mix together the lettuce and onion. Toss with the remaining olive oillemon mixture. 5 of 5 To serve, place equal amounts of salad on 4 plates. Top each with 1/4 of the remaining Parmesan. 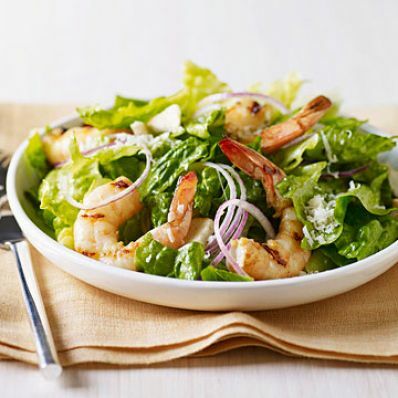 Divide shrimp and bagel chip pieces evenly over salads. Serve immediately.